Jackson Blackmon will ride a Riderz Law backed Yamaha in the Liqui Moly Junior Cup class in 2019. 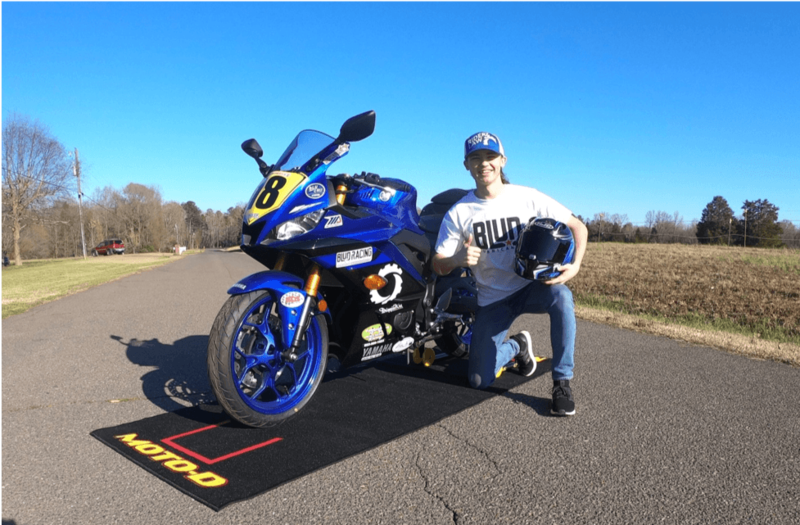 Jackson Blackmon, 17, from Rock Hill, SC will enter his second year of the Liqui Moly Junior Cup Championship once again on a RiderzLaw backed Yamaha. Jackson will contest the championship on the new and improved 2019 Yamaha R3. RiderzLaw Motorcycle Lawyers are becoming a household name in motorsports with five offices in California. The motorcycle will be fitted with a GYTR race kit, Graves exhaust, HotBodies fairings, Ohlins suspension from Fast Bike Industries, ecu tuning by Norton Motorsports, and prepared by D&D Cycles of Pensacola Fl. Along with many returning sponsors we are very happy to announce a few new partnerships. Blud Lubricants will be our oil of choice in the quest to win this year. Blud Lubricants is specially formulated to keep up with the high demands that a championship may throw at us. HJC Helmets, the industry leader in motorcycle race helmets since 1971 has come on board this season to provide Jackson with the safest and best looking helmets on the market. Former racer Chuck Blackmon, who is Jackson’s father, will again be crew chief and lead mechanic. John Demasters will handle our data and race prep. Jackson also had this to say. We would like to thank all our sponsors for making this season possible, RiderzLaw Racing, Finishline Machine, Blud Lubricants, HJC Helmets, Yamaha, D&D Cycles, Motion Pro, SBS Brakes, Rock Hill Powersports, Graves Motorsports, GWR, MotoD, Fast Bike Industries, Fast Frank Racing, DrippinWet, HotBodies, Norton Motorsports, John DeMasters, Papa Charlie, Chuck Blackmon, and Dainese.